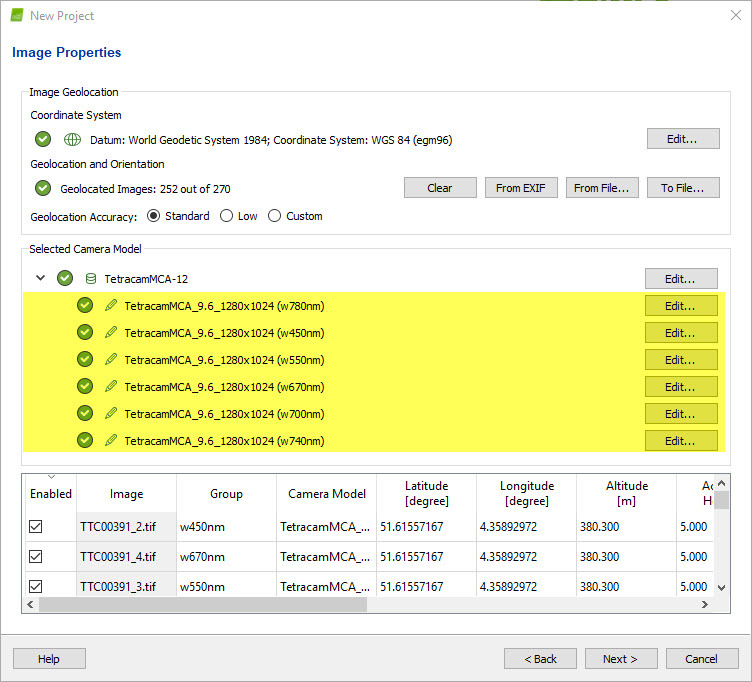 In order to process Tetracam imagery with Pix4Dmapper you need to provide images with the following Exif tags. Along with the imagery, the MCA file is requested. The MCA is a text file containing geometrical information and spectral sensitivity per band. Pix4D relies on the fifth column, i.e. which contains the central spectral wavelength and bandwidth. The central spectral wavelength and bandwidth must be greater than 0. If the fifth column contains 0 or ILS values, the camera is not used. The number of lines in the MCA files must be equal with the numbers of bands in the multipage tiff imagery. Disclaimer: Due to the complexity of unknown situations, the personal support is not applicable in case the dataset is not fulfilling previous requirements and the camera is not in our database. To further address the issue please contact camera manufacturer. Create a new project: Step 2. Creating a Project. Import the images: Step 2. Creating a Project. (optional) In the Select Output Coordinate System window, select output/GCP coordinate system: How to select / change the Image / GCP / Output Coordinate System and click Next. On the next window, depending on how many bands your camera have you should now see a different camera model for each band. 6. In the Processing Options Template window, select the template Ag Template and click Finish. 7. In the Processing bar, click Start to start the processing. After step 1. Initial Processing, step 2. Point Cloud and Mesh and step 3. DSM, Orthomosaic and Index are processed, a reflectance map for each band is generated. 8. Open the Index Calculator to work with the Reflectance Map and Index Maps. For more information about the Index Calculator: Menu View > Index Calculator. Note: Tetracam imagery datasets are not fully supported on Pix4D Cloud since the MCA file cannot be uploaded. For Tetracam imagery, Pix4Dmapper does not apply any radiometric corrections. What is the equirectangular image format?